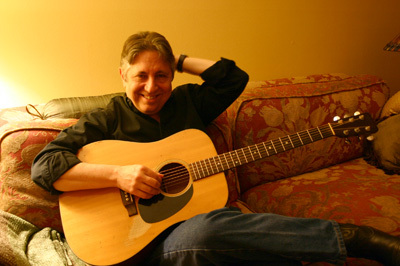 Jim Bruno is a San Francisco Bay Area based published songwriter and currently teaches Songwriting at Foothill College in Los Altos, Hills, California. Songs he’s written have been recorded and released by Shawn Colvin, Mary Lou Lord, Cliff Eberhardt and Laurie MacAlister. Songs he’s co-written have been recorded and released by Chuck Prophet and Thad Cockrell. As a performing songwriter he has performed with or opened shows for the following artists: Shawn Colvin, Timothy B Schmidt, Graham Parker, John Gorka, Charlie Musselwhite, Joe Ely, Greg Brown, Mary Lou Lord, Steve Forbert, Bill Morrissey, Big Twist, and Cliff Eberhardt. He’s performed at the Greenwich Village Folk Festival, the Udine Folk Festival in Udine, Italy and has toured five times in Europe. He also played bass, guitar and sang in the Shawn Colvin Band and often performed with Shawn as a duet. He recently released his own album of all original songs called ‘Alright Alright’. He’s negotiated and signed numerous song publishing agreements. Among others these publishers include Bug Music and the Welk Music Group in Los Angeles, and Largo Music in New York. In addition to his having his own publishing company, Jimmy Bruno Music, as a songwriter he currently has a music publishing agreement with Universal Music Group. He is an affiliated Publisher and Songwriter with BMI and the Harry Fox Agency.